Versatile and great fun to use, with rich, bright colours and none of the mess of traditional pastels. 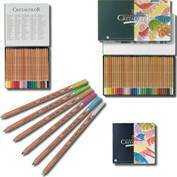 Stabilo CarbOthello Pastel Pencils have a lovely dry stroke which can be easily blended dry or with water. With a highly pigmented, 4.4mm core CarbOthello gives a beautiful finish on dark backgrounds as well as on lighter paper. High levels of lightfastness and great luminosity and opaqueness. Faber Castell Pitt Pastel Pencils are lovely, soft pastel pencils in colours from the warm and earth hues which work epscially well in pastel pieces.